In the first age, a small tribe of humans who had made their homes deep in the forest witnessed their homes destroyed by the onmoving civilization. After regrouping, they began a resistance against the intruders, devoting their lives to protect the nature around them. Their dedication touched the heart of Diocletian, the patron of Warlords, and a deity familiar with nature. He bestowed upon them the powers of nature, the bloodline of the animals in the forest, to aid them in their quest. The humans became half-human, and half-beast. These who were later known to be called the werebeasts roam the forests mostly in their human form, but when in danger, or when the rush of adrenaline excites them, then their hidden powers are released, and they will transform into the beast they were blessed as. While as the beast, the main attribute of the beast will be added to the human's potentials. However this requires a lot of energy from the beasts, which limits how often they can switch to beast form. What determines which beasts they transform into is decided by the beast when it decides you are ready for the merge. Thus only the more experienced werebeasts shall know which beast they have been blessed with. Werebeasts also have the instinct to predict danger nearby, enabling them to escape aggressive mobs or no-exit traps. Having seen their own populations decimated, they have developed an intense contempt for evil. Races that are traditionally involved with engineering and masonry - town-building activities that also involve flattening forests - are not good drinking partners for the werebeasts. The race they dislike the most is the dwarfs. They also believe that magic as practiced by mages is unnatural. 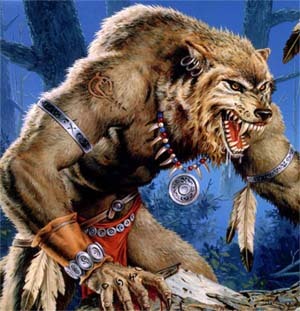 A werebeast must reach at least rank 15 before he can merge with an animal. Each werebeast may only transform into one kind of animal. Male werebeasts may transform into a tiger, a wolf or a boar. Female werebeasts may tranform into an ocelot, fox or falcon. Pain is a catalyst for lycanthropy.